As a small business owner, you know that managing costs is of utmost importance to your business. Also high on that list of important business concerns is working efficiently, and freeing up resources to focus on the most important parts of your business. In the modern business environment, one of the best ways to optimize your operations is to make significant use of digital documents, if not entirely. But as with any small business initiative, that can seem daunting and time-consuming. With that in mind, here are 7 tips to get started with this vital part of your business – ones which can open up new opportunities for efficiency and growth within your organization. Besides the obvious goal of cutting long-term costs that can stem from the reduction of paper use around the office, there could be a number of other goals that you’re looking to achieve by using digital documentation in your internal and client-facing dealings. For one thing, beyond the financial implications of cutting paper use, it’s also the environmentally-friendly choice to make. And as mentioned above, there is also significant potential to make your organization’s operations much more efficient by cutting out the need for physical printing, filing, and mailing. Make a list of everything that you hope to achieve through your company’s use of digital document management. Do you hope to document your customers’ information? Integrate their information with a customer relationship management system? Or perhaps you just want to reduce the burden of the time and costs associated as much as possible. 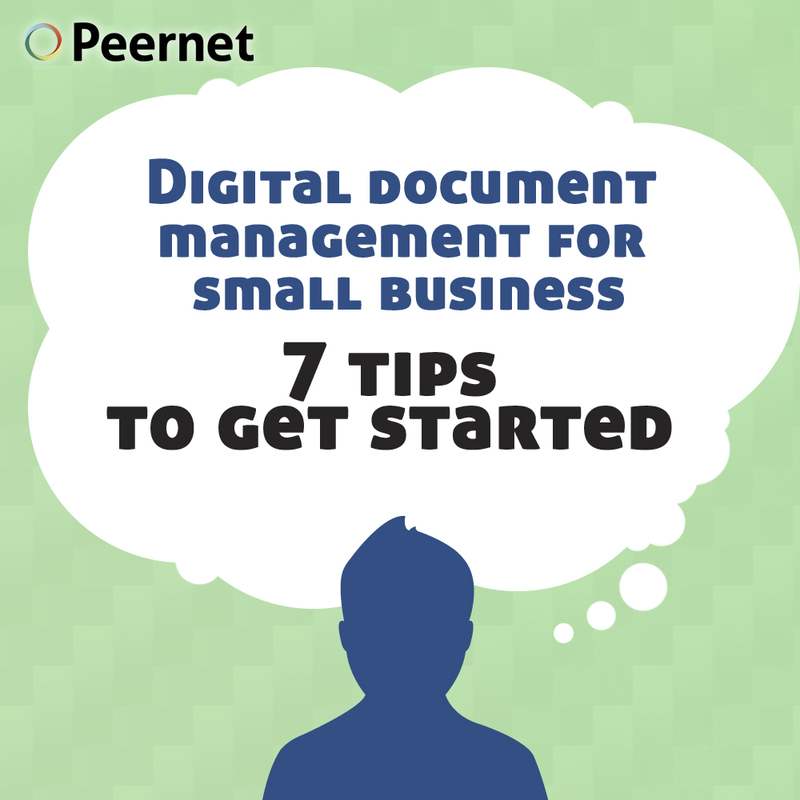 Whatever the case, starting with this base of requirements can inform your choices in the following steps, and also provide guidance to the companies you are dealing with, if any, to help set up and implement your digital document management. 2. Set aside a budget. As you can see, there’s substantial potential for cost savings to be had, depending on the size and scale of your operations and your digital document management system. For companies that are a bit larger, you may want to look at investing in a fileserver that all computers in the office are remotely linked to. Another option is using an offsite server, sometimes referred to as a cloud service, to store your organization’s documents and files. 4. Choose File Formats that Suit the Needs of Your Business. This might take a little bit of research, but is well worth the time invested. Here is a brief primer on a few of the most common file types used across the business world today. .DOC, .DOCX. This is the standard file format used by Microsoft Word. Word is the world’s most commonly used word processor, so you will end up sending and receiving at least some files in this format. However, it comes with some drawbacks; most critically, that document formatting can be greatly changed when sending a document from one computer to the next. This can make you look unprofessional in the eyes of your clients and customers. To avoid this problem the next format listed is ideal for many businesses. PDF stands for portable document format. It was developed in part to address some of the shortcomings of Word, in that document formatting is exactly maintained from one system to the next. The format has some other huge benefits in business use. As with Word, the format is widely used, so there’s not much worry about the recipient being unable to view the document you’re sending, correctly. File size tends to be small while maintaining good quality. You can integrate anything you would into a Word document, such as links, pictures and the like. And the files can even be password-protected, adding a layer of security that’s important for any company dealing with digital documents. The TIFF file format was originally developed to handle scanned documents, so its roots in the business world are firmly established. Like PDF, the formatting of a given file is maintained across all devices and operating systems. TIFF files will tend to be larger than PDFs, but the format offers flexibility that allow you to customize the compression of files, balancing quality and file size. Because of its high quality and relatively secure features built into the format, TIFF is widely used in a variety of professions and industries that transmit sensitive customer data. You may also make regular use of some of the following file formats in your day-to-day business operations: PPT (Powerpoint); .XLS, .XLSX, .CSV (Excel); .GIF, .PNG, .BMP (image formats); .TXT (Text file); .HTML (webpages); .PUB (Microsoft Publisher); and many more. 5. Choose document conversion software. Choosing the right software as a conduit to your digital documentation and records management is of critical importance. You will likely find that you need to do file conversions on a regular basis. As a business, one thing that you generally don’t want to be relying upon is free online conversion tools. These can be located on untrustworthy servers, and slap watermarks on your documents. As well, they often don’t offer much in the way of output customization. Peernet offers a wide variety of software to fit your document conversion requirements. Our line of image printers (Raster Image Printer, TIFF Image Printer and PDF Image Printer) offer outstanding functionality and are priced to suit the budgets of small to medium sized businesses. Best of all, using these programs is as easy as printing a physical document – they simply show up as options when you go File > Print. And just like that, your converted file is ready for you in the format that you require. If you have a regular need to create PDF files, you may also find value in our PDF Creator Plus 7.0 software. This program is built as a more cost-effective alternative to Adobe Acrobat, allowing you to create PDF by combining and editing other files. Another option, depending on your needs, is our Convert to PDF 4.0 program. This is a virtual printer that allows you to convert documents to vector PDFs, allowing them to be searchable and editable. For more information on our file conversion software, and which program may be right for the needs of your particular small business, please contact us or watch the short video below. 6. Implement a system of document organization. If you’ve ever wasted time rifling through an unorganized file cabinet looking for a certain document, then you already know the value of a good organizational system. The same applies with digital record keeping and file conversion. You want to establish a consistent protocol and naming convention that allows you to easily track, sort, and search relevant documents. This is not only a huge time-saver, it also allows you to fully maximize your time and cost-savings by maintaining digital documents or physical, paper documents. For some ideas on how to do this, please check out our previous blog post called, File Name Structure for Business: a Guide to Save Time and Stay Organized. 7. Establish Document Security Protocol. Just as you’d want some sort of security system in place for your physical documentation, the same goes for digital documents. This particularly holds true if you’re maintaining customer information either on your in-house systems or on a cloud server. There are several steps you can take to help secure your systems. First, make sure that you and your staff’s computers all have antivirus and anti-malware software installed and that the software is regularly updated to catch the latest threats. It’s also important to establish and maintain a regular schedule of scans, which can be automated if you wish. You should also establish and stick to a set of good practices to ensure that your customer, client and internal data is protected as well as it can be. You should figure the minimum amount of a customer’s information that your company needs to have on file, and never go beyond that (especially credit card numbers.) This can help limit the amount of damage done to your reputation in the unfortunate event of a hack or a leak. Finally, establish a routine of regular document backups. In the event of an issue with your physical equipment, or something like a flood or a fire, taking this simple step will save you a lot of time and trouble in the end. We’re always willing to lend a helping hand and point you in the right direction for your company’s file conversion and digital documentation needs. Be sure to check out all of our file conversion software, and don’t hesitate to contact us with any questions you may have.